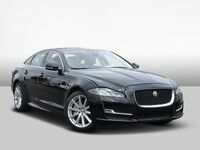 The 2017 Jaguar XJ is the pinnacle of the Jaguar sport sedans, offering a pleasing combination of high-powered engine options, comfortable and refined interior, exquisite English craftsmanship and state-of-the-art technology. If you desire a luxuriously appointed sedan that delivers spectacular performance, then you'll find the XJ to be an excellent choice. 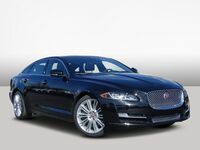 One of the XJ's full-size luxury sport sedan competitors is the Mercedes-Benz S550. 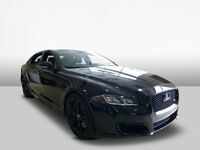 Take a look at this 2017 Jaguar XJ vs 2017 Mercedes-Benz S550 comparison to see how they measure up. Both luxury sport sedans boast a very high-performance driving experience, but the XJ offers a wider selection of engine options, as well as greater power and speed capabilities. Engine choices include a 340-hp 3.0L Supercharged V6, 470-hp 5.0L Supercharged V8 and the top of the line 550-hp 5.0L Supercharged V8, which produces a top speed of up to 174 mph and accelerates from a standstill to 60 mph in just 4.4 seconds. In comparison, the Mercedes-Benz S550 only offers a 449-hp 4.7L V8, with a 0 – 60 acceleration time of 4.8 seconds. Also, further elevating the XJ's performance is its high-tech 8-speed transmission. It's controlled by the ingeniously designed JaguarDrive Selector, which rises into your hand once the Start/Stop button is pressed. 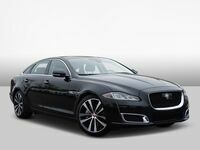 Jaguar XJ vs Mercedes-Benz S550: Which luxury sport sedan is better? The 2017 XJ is also the more reasonably priced vehicle, with a base MSRP that is over $22,000 lower than the 2017 S550 ($74,400 vs $96,600). Even with the XJ R-Sport base model, you'll get a wide array of standard premium features. This includes an adaptive and self-leveling suspension, front and rear parking sensors, automatic wipers, rearview camera, auto-dimming mirrors, automatic adaptive bi-xenon headlights with automatic high beams, auto-dimming mirrors, keyless ignition and entry, blind spot monitoring with cross-traffic alert and leather upholstery. Also, the XJ comes with a unique feature — a panoramic, heat-reflective glass roof that sweeps back and over the rear seats. It filters UV rays and floods the interior with natural light, making it feel beautifully airy and very spacious. As can be expected from high-level luxury vehicles, both the XJ and S550 have premium interiors, but it's hard not to be more impressed with the XJ. The quality of craftsmanship throughout the cabin sets it apart with a wide choice of colors, materials and finishes. The feeling of luxury is punctuated by exciting comfort elements, and phosphor blue lighting creates an elegant finishing touch. Also, the XJ is equipped with an array of standard and optional InControl and driver assistance systems to make driving easier and more convenient. Every XJ is fitted with Jaguar InControl Touch Pro as standard — the fastest and most advanced infotainment system ever from Jaguar. If you live in the San Antonio-area and would like to get behind the wheel of the luxurious and high-performance 2017 XJ, then be sure to get in touch with us at Barrett Jaguar!